Have to admit this made me smile. I'm pretty tired of the real song, but since most of this is dead on, I can't resist sharing. I spotted acetate overlays and other opaque types of "sheer" items in several booths. This makes me happy because it was a sad day indeed when Hambly stopped making them. Die cut overlays at Bella Blvd. Clear overlays at Bella Blvd. Calligraphy style writing is still going strong and often in gold or other color foils. This is another one of those products that crosses over so perfectly to home decor. Thin wafer dies have been around for awhile now, but it seems there are more and more of them to choose from. In addition, many die sets have matching stamp sets allowing you to easily cut your stamped shape (rather than fussy cutting). Not only is this a big timesaver, but the cuts are uniform with every item! This is another of those products that wasn't new to the show floor, but that seemed more abundant (at least to me) with lots of fresh options. Well, that's it for this year. My photos don't really capture what my eyes did, but at least they give you a hint of what's to come. By the way, there are LOTS of CHA reviews out there to get more perspective on what's trending and happening in the craft industry. Try googling "cha2015 recap" and see what comes up. And enjoy! I'm just back from the Craft & Hobby Association's annual trade show, often referred to as "CHA". It's a "to the trade" convention where manufacturers in all types of crafting introduce new products. I first started attending with my local scrapbook store. All of us teachers/design team members would scope out cool new stuff and let our owner know what products we wanted to see in the store to teach with and help promote. These days, my role at the show has changed. Now, I work the show for one of the coolest companies in the industry --Pink Paislee (part of the American Crafts family of companies). Their new releases this year are absolutely adorable! 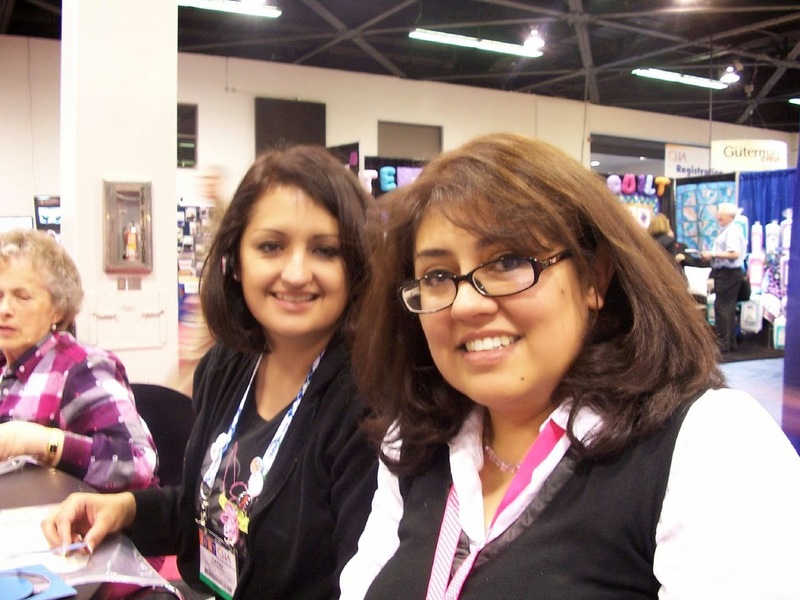 Being in their booth I get to meet and chat with lots of interesting people in the industry from all around the world, while introducing them to the yummy products. So what's new from Pink Paislee? Two new lines debuted, the first of which is a travel line appropriately named Atlas. The second of the new lines is called "Citrus Bliss" and it's just adorable too. One thing I'm loving in both the new lines is that they both feature an acetate overlay sheet and a vellum sheet as part of the collections. For Atlas, the overlay is a gold world map on a faint grid and the vellum is silver airplanes. 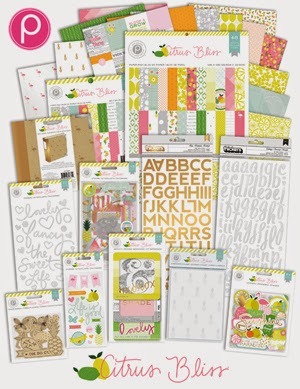 For the Citrus Bliss collection, the overlay is little pink flamingos and the vellum is gold pineapples. So stinkin' cute! I love the lemon-lime pallette and the trendy accents! On the last day of the show, I walked the rest of the booths and got to see what's up and coming. Here are some of the things that caught my eye. So, in case you haven't heard yet, foil is THEE thing! I feel like I saw it everywhere (along with other forms of shiny, glittering goodness). 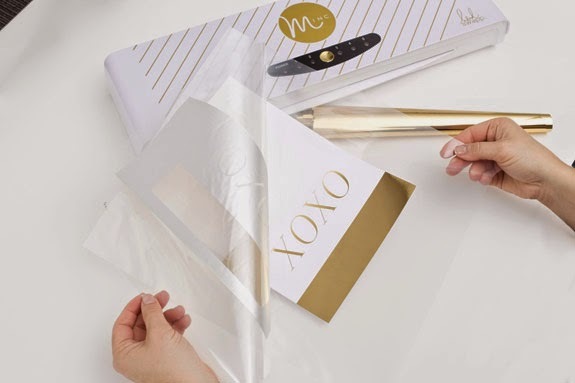 And of all the foil by far the most exciting release to me was the new MINC machine from Heidi Swapp. 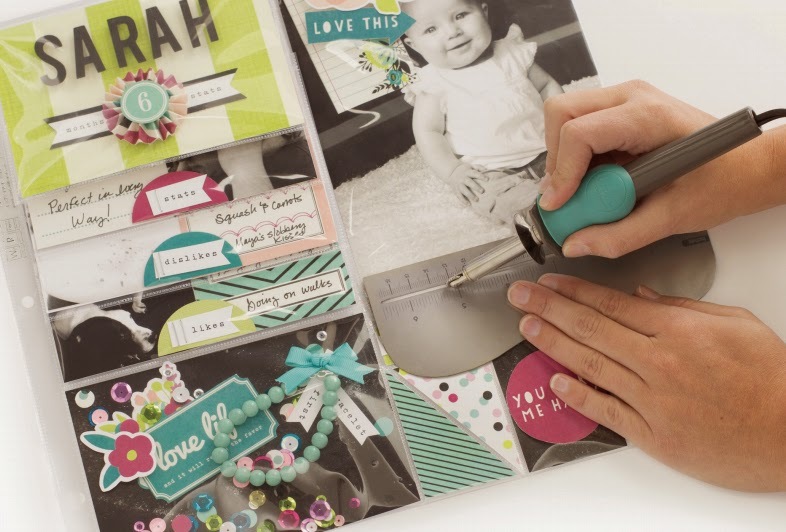 It allows you to easily add colorful foil to your projects in so many different ways. The machine reacts with laser toner so you can create custom items on your own laser printer, OR you can use any of the pre-printed papers and embellishments available. Heidi's media team even showed me how you can use the "negative" from one foil to add multiple layers of foil to another. It is so cool! Click here to watch a quick demo video of the Minc machine in action. Here is more foil that I and/or gold and/or sparkly stuff I spotted around the show floor. I noticed some fun PARTY and CELEBRATION themes in a few of the booths. It makes me happy to see papercrafts coming up off the page. Scrapbooking papers and embellishments are just so beautiful to limit them to only being inside of books. More and more of the booth samples seemed to be about home accents. I noticed feathers are still around and now I've also seen native looking patterns and shapes like tee-pees too. For lack of a better description I'll call this "Native American" influence. I noticed it in a few places. Of course we've seen it in clothing for some time. Click this link to watch a demo video of the Fuse in action. Well, that's all for now. But I've got more coming, so stay tuned!